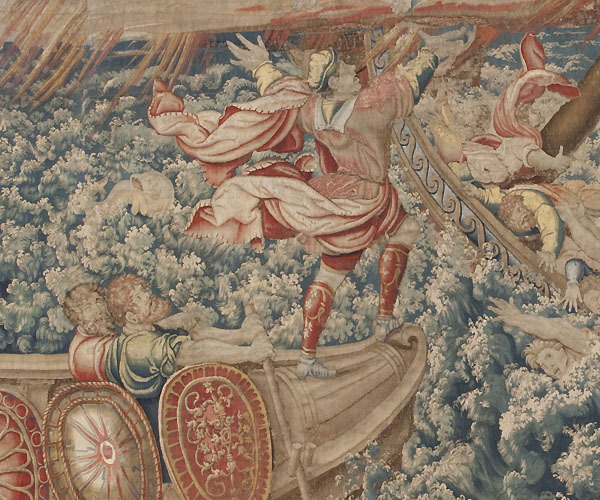 This History of Dido and Aeneas is comprised of seven tapestries inspired in Virgil’s Aeneid. The series comes from the collection of Mary, Queen of Hungary, and an aunt of Philip II. The king got it as a bequest, linking it to the crown of Spain. 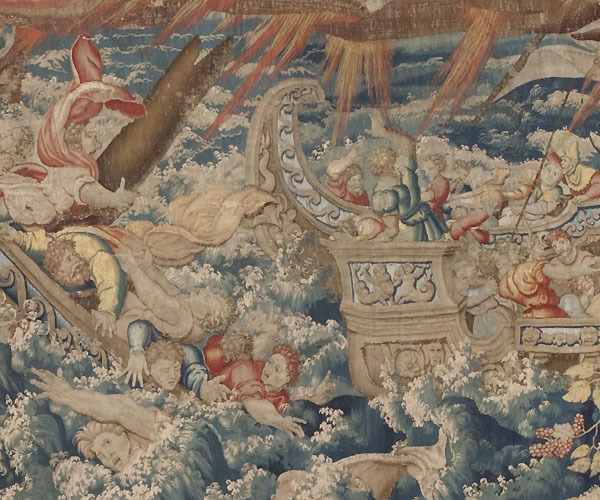 This instance is a re-edition of the Navigation of Aeneas, a tapestry commissioned by Andrea Doria (1466-1560), Genoese admiral of Charles V.
Inspired in book I of Virgil’s Aeneid, the tapestries were woven in Brussels between 1550 and 1555, following the cartoons designed between 1530 and 1535 by Perino del Vaga for the Genoese admiral, in order to pay homage to the Habsburg monarchs in his palace of Genoa. P. Junquera de Vega y C. Herrero Carretero, Catálogo de Tapices del Patrimonio Nacional. Volumen I: Siglo XVI, Madrid, Patrimonio Nacional, 1986, pp. 325-326. Bernice Davidson, “The Navigatione d'Enea. 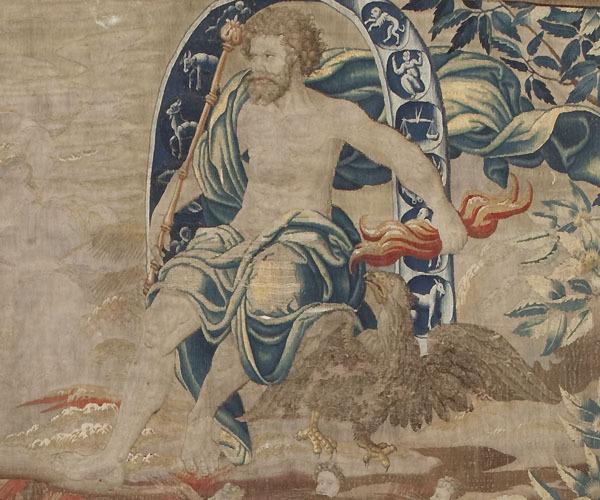 Tapestries designed by Perino del Vaga for Andrea Doria”, The Art Bulletin , Vol. 72, 1990, nº 1, pp. 35-50. 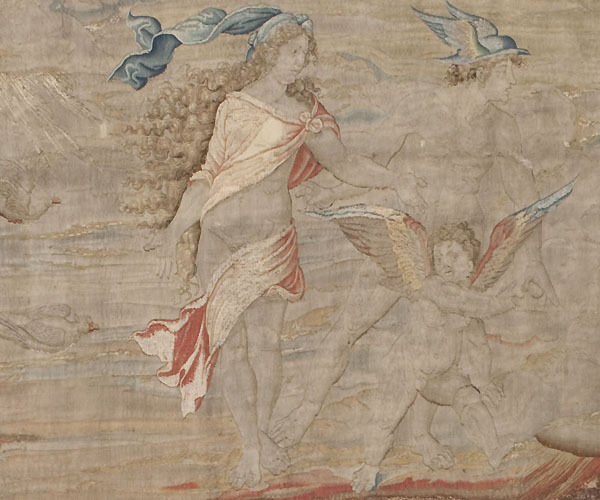 Jerry Brotton, “Cartaghe and Tunis, The Tempest and Tapestries”, en “The Tempest” and Its Travels, ed. P. Hulme and W. H. Sherman, Londres, Reaktion Books, 2000, pp. 132-137.